help you find the Yeti that’s right for you! Our first-ever YETI cooler on wheels is the answer to taking Tundra’s® legendary toughness and unmatched insulation power the extra mile. And nothing was sacrificed in the making of this cold-holding powerhouse, ensuring the Haul™ lives up to the Tundra name. The Tundra® Haul™ is now the toughest cooler on two wheels. YETI Ramblers are advanced personal drink coolers made from 18/8 stainless steel with double-wall vacuum insulation. Rambler Tumblers will keep your soda or mixed drinks cold twice as long as plastic cups, and make an excellent YETI coffee mug. The Rambler Colster locks in the cold of cans and bottles using a heat-mocking ThermoLock™ Gasket. Available in 20 and 30-ounce sizes. Security Cable Lock & Bracket, Beverage Holder, Drain Plug Hose Connection, T-Rex latches, Bottle Opener, Bottle Key, Locking Brackets, Hats, Shirts and MORE! 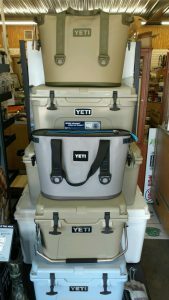 Stop by J&N Feed and Seed, and see our selection of Yeti coolers, drinkware, and accessories. This entry was posted on Tuesday, October 16th, 2018 at 9:46 am	and is filed under News & Updates. You can follow any responses to this entry through the RSS 2.0 feed. Both comments and pings are currently closed.